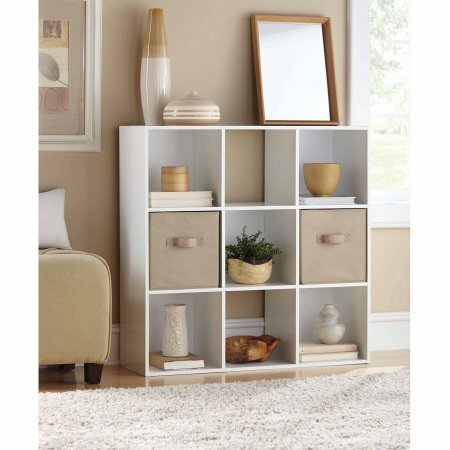 Mainstays 9 Cube Storage, Multiple Colors: 4 open-backed cubes and 5 backed cubes Assembled dimensions: 35.38"W x 11.75"D x 35.38"H Cube opening: 11.13"W x 11.13"H Colors: Multiple Colors Model #ES108696A Package Dimensions: 5.2"H X 39.53"L X15.28"W Provides display and storage space Compatible with collapsible bins and baskets Coordinates perfectly with the Mainstays Collapsible Fabric Storage Cube, Set of 2 , Multiple Colors (10.5" x 10.5"):http://www.walmart.com/ip/Mainstays-Collapsible-Fabric-Storage-Cube-Pack-of-2-Soft-Silver/46271140 Organizing your home is not a one-and-done challenge, particularly if you have a large and active family - for example, your son can never find his baseball cleats, your bookshelves are overflowing with books, photos and knickknacks, and you generally feel that your home could stand some organization. The best way to get organized is with a home storage system that can fit seamlessly in with your existing decor, like this nine-Cube Storage Organizer by Mainstays, which offers versatile storage options and will look great in almost every room of your home or apartment. You can customize the configuration of the organizer and change up its look with bins and baskets (sold separately). This organizer includes four open-backed cubes and five backed cubes.